Late 1600s Early 1700s trundel bed? Re: Late 1600s Early 1700s trundel bed? Pam, I am really looking for what a W&M short bed (3-4' tall) might look like. I expect that the main bed would have the mattress height of 30+/-" I am interested in making it a single bed even if they never existed or were never recorded. From there I want to make it so a trundle will fit under it. My main interest is what the turnings might look like; I will work with what ever mattresses I need; a fouton mattress might work (box springs are not in the picture). This will be used in a small room and my interest is having it look like the period that I like, not take up more than a single bed and be able to accomodate two if needed. 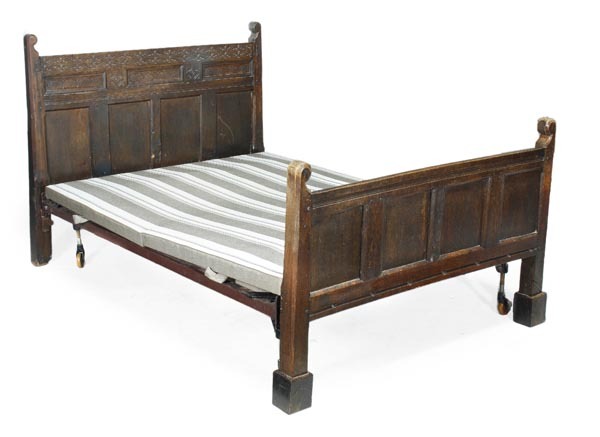 This bed predates your preferred William and Mary period by thirty years; however, items like beds were not susceptible to the same fashion swings as living room furniture, so I'm fairly confident this bed would meet your needs. As can be seen ? and the description supports it ? a modern iron mattress base has been added, however, you can clearly see the rope channel and holes along the foot board.